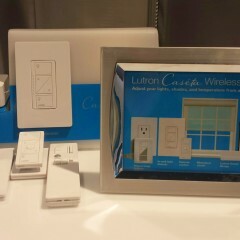 Home automation is now easier than ever with the Lutron Serena shades and the Nest home system! In this blog post, we will highlight the features of the Lutron shading system and show you how easy and affordable it can be to bring the future in window technology to your home. No electrician needed to sync your window coverings with your home automation system! We found the hottest 2015 window treatment trends are automated window treatments for your home or office by Lutron. Not only does home automation bring ease and simplicity to your day, automatic and remote controlled shades can help keep your home safe. Watch how Lutron’s Caséta Wireless system controls the Serena shades, lighting, and Nest thermostat all via one mobile app. The future is here. Modern technology is now making it easier and more affordable than ever to integrate your home systems. When your lighting, window shades, and thermostat are all communicating and synced, it brings the control right to your fingertips for a safe, comfortable home. Lutron Shades takes motorized blinds to the next level by integrating with home automation systems. With just one tap of your finger on your mobile device, watch your window shades roll up to let in the morning light or close softly to signal the day’s end. You can also easily control both indoor lighting and blind positioning according to pre-set moods in the app to set the tone for movie nights, intimate dinners, or simply to wake up to a bright home in the morning. Lutron shades bring a sense of luxury and durability to your home at an affordable price. The Serena shades are battery operated, making for easy installation with no electrician required for installation. The shade’s ultra-efficient function brings battery life to 3-5 years, making battery changes few and far between. Serena shades also come in a variety of colors to enhance your personal style. While the shades are remote controlled, they can be easily synced with the Lutron Smart Bridge and Caséta Wireless system and further integrated with nest thermostats and other systems for a fully automated home. 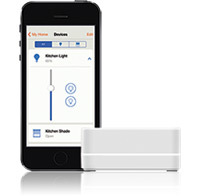 Use the smart bridge to integrate Lutron with other systems. Not only does home automation bring ease and simplicity to your day, automatic and remote controlled shades can help keep your home safe. Lutron Serena shades are free of dangerous cords, making them a child and pet safe window treatment option. With the app, you can quickly and efficiently lower shades for privacy at night or when you’re rushing out the door. Home automation also helps your home save energy. Pre-program your system to raise or lower your shades at certain times of the day to keep indoor temperatures consistent. Working with the Nest thermostat, your home system can even “learn” your temperature preferences to keep your home comfortable while saving you money on your energy bills. 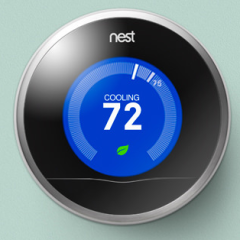 The Nest Thermostat can even “learn your temperature preferences. Since they are synced wirelessly, no electricians needed for installation! 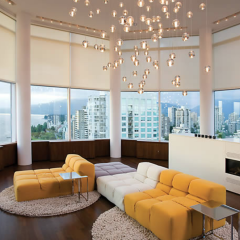 Lutron shades can easily be integrated with your pre-existing home automation set-up. Simply use the Lutron bridge and Caséta systems to sync your lighting, window treatments, and third party automation products such as the Nest thermostat. Take the next step to a fully automated home with Lutron shades by speaking with one of our knowledgeable designers and find the best motorized window treatment options compatible with your home automation system. You can also stop by our showroom to view our large selection of window treatments in Southern California. This system is cutting edge. The fact that you can do this without wires is a plus not to mention you can control your shades and other devices from you cell phone or tablet. This a great solution for windows behind a sofa or in a master bath! I also love that they can be controlled by my cell phone! Awesome system no need to have to get up when my dogs are laying on me just one click! and I can integrate it with my iPad and iPhone love the comfort and versatility way to go 3 blind mice! What a great way to make our lives easier! Cutting-edge and fashionable all in the same sentence.